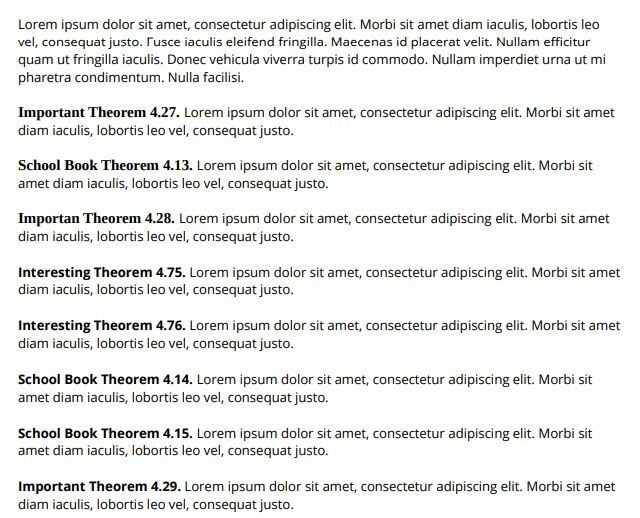 I need to categorize theorems like School Book Theorem, Important Theorem, Interesting Theorem etc with different numbering. The same at the exercises. Browse other questions tagged numbering theorems exercises or ask your own question. Common, per-section numbering of theorems, lemmas etc. How do I get the numbers for theorems, lemmas, examples, etc. before the type? Should theorems, propositions, conjectures, etc. share a common counter? How can I style exercises like that?